Admit it, you started singing along with the Beatles in your head when looking at the post title. After two weeks of cold, rain, and wind, a nice day is finally here. Spring and early summer are often a bit grey and wet, but even the Dutch have been saying that the extent of our gross, wet weather isn't typical. Last week we had a couple of days where it would rain for an hour or two, followed by a quick 10 minute hail storm, 15 to 20 minutes of sun, another 10 minutes of hail, an hour of heavy rain, and repeat. It was cold and annoying. Even on the few days it wasn't raining, it was cold enough to put the heat back on in the house. But for today, the sun is back and we'll take advantage of being outside before the rain returns tomorrow. Little Man was playing in the garden this morning and was so happy to be able to dig around without his bulky coat that we had to change his clothes before his afternoon session at peuterspeelzaal. At the moment that I'm writing this, the cats are playing in the garden (without the terror of the child in the garden), letting the sun soak into their fur, and striking fear into the hearts of small flying insects. 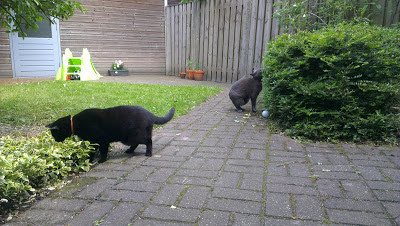 Sebastian and Zappa taking in the spring fragrances. 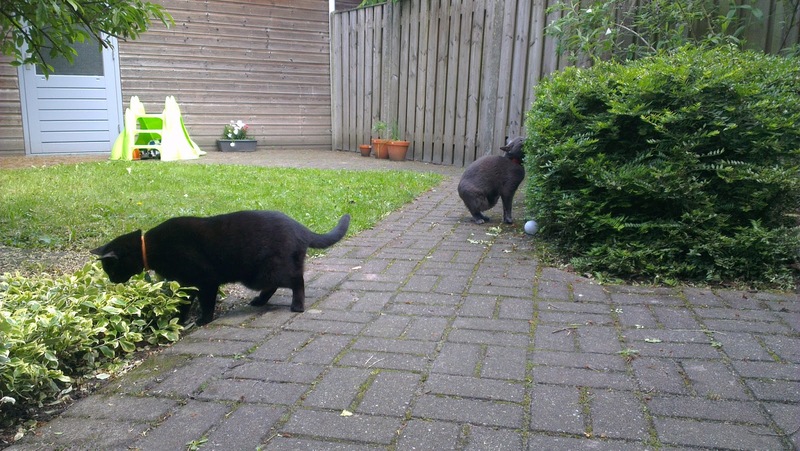 Tomorrow we'll go back to carrying our umbrellas around, the cats will snub the idea of the "great outdoors," Little Man's mud supply will be replenished, and our neighbors and friends will tell us, "Dit weer is niet normaal (This weather is not normal)." But it's nice for a small break every now and again that remind you summer is coming soon.